717.283.4593 We believe that no person should be prevented from fully engaging in life due to untreated hearing loss. Each year we donate a portion of our proceeds to help people who cannot afford hearing aids. Dr. Schmitt practices at our Lancaster office. He has multiple special interests, including the relationship between hearing and cognition, hearing instrument technology, and tinnitus. He has studied with some of the leaders in these fields and is excited to bring his knowledge to Lancaster County. 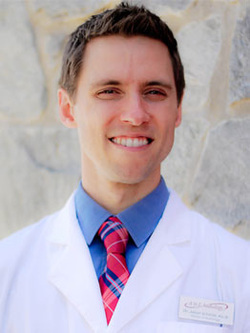 Dr. Schmitt is originally from Edinboro, PA, located in the “snow belt” approximately 15 miles south of Lake Erie. He enjoys skiing, backpacking, homebrewing, triathlons, kayaking, and anything dealing with Penn State. He lives in Lancaster with his wife Jessica, a personal trainer and therapeutic support staff professional who is also from the Erie area. "A&E in Lititz, PA is extremely inviting. The folks there are on top of their game, with great knowledge and wonderfully easy to understand explanations about the hearing tests. They outfitted me with a great hearing aid that helps me tremendously and fit my budget. This is by far the best Audiology clinic I have ever been to. I highly recommend. "- Andrew W.
"This place is amazing. The office is well put together, the ambiance is beautiful and the staff is amazing. Whenever you need to have your hearing tested, this is the only place in the area you should come to! "- David T.
"I have been a patient for over 10 years, and I have always had a wonderful experience with A&E Audiology. The audiologists ensure that you are satisfied and the staff is so considerate. I have been wearing hearing aids since I was four and this is by far the best practice I have been to, and I have no intention of going anywhere else! "- Bethany N.
Our Lancaster PA audiologist, Lititz PA audiologist and Willow Street PA audiologist provide award-winning hearing care and hearing treatment for children, teens and adults. Our hearing care and treatment includes reducing the risk of dementia, improving cognitive function, restoring hearing clarity, tinnitus treatment for ringing in your ears, invisible hearing aids, custom ear plugs, hearing protection devices, and hearing consultations. Come experience A&E Audiology & Hearing Aid Center! You will see for yourself that our audiologists, hearing doctors and hearing specialists provide award-winning hearing care in Lancaster, PA, Lititz, PA, Willow Street, PA, Rohrerstown, PA, West Township, PA, Millersville, PA, Mountville, PA, Central Manor, PA, Landisville, PA, Silver Springs, PA, Lancaster City, PA, Mt Joy, PA, Marietta, PA, Neffsville, PA, East Petersburg, PA, Manheim, PA, Rothsville, PA, Akron, PA, Ephrata, PA, Brownstown, PA, Leola, PA, New Danville, PA, New Providence, PA, Strasburg, PA, Buck, PA, Quarryville, PA, Conestoga, PA, Rawlinsville, PA, Georgetown, PA and Christiana, PA. Call 717.283.4593 today!